Since 2013 we have helped them with many things including SEO, traffic driving strategies, Facebook/Social Media tutoring and guidance, email newsletter assistance, mailing list growth, helped them improve their old website and when they were ready for us to totally redesign and rebuild their website we did that too. Their new site has been up and running for about 3 years and is performing brilliantly for their business. Update: 4 January 2019: The website still performs brilliantly. 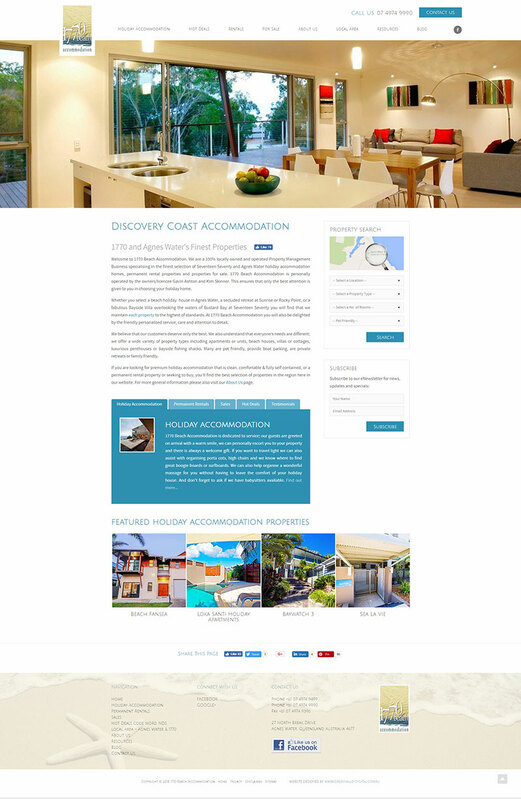 The home page of the 1770 Beach Accommodation website. The site must appeal to customers (or potential customers) of all ages. Therefore the site needed to be sophisticated but also really appealing and very easy to navigate and read. Must be very attractive and really ‘showcase the business’, the holiday accommodation and permanent rental properties and the region. Be a comprehensive website that really explains why their business is different (and the right business to choose vs those of their competitors). Must be a fast loading mobile phone friendly website. Include content that is up to date. Ability to choose which holiday accommodation properties are featured on the home page. Social Proof: utilise social media to prove to site visitors that their business is great. Integrate with their Property Management System, Channel Manager and Online Booking System. Ability to update the website themselves including adding and removing properties. A site design that appeals to their many varied customers and target audiences. A site that is built so it is Search Engine Friendly and so that SEO campaign work can be done effectively. A blog built into the website so they can ‘blog for business’ as part of the inbound marketing strategy. After exploring their goals and expectations in depth, we proceeded with our pre-production strategic planning method. We then presented them with a website design concept that we believed would perform very well for their business and play its part in achieving their goals; both now and into the future. Re-organised a lot of the text from their old website so it was well written and faster for their site visitors to read but of equal, if not, higher quality and value. Built the site so it is Search Engine Friendly. Integrated the site with their Property Management System, Channel Manager and Online Booking System. Photos within the website were also treated with respect and care. All the photos were correctly resized and optimised to ensure they load fast. We helped 1770 Beach Accommodation find new photos that really do the website, business and the region justice. Built the website so they can login and do updates whenever they like. They can also easily add or remove properties and easily nominate which properties appear on the home page as ‘featured properties’. Did SEO work and continue to assist them with this. They know that SEO is a never ending thing and is integral in every aspect of running a small business type such as theirs. We also send them regular SEO Target Keyword Phrase Rank Reports. Setup and configured ‘Website Caching’ and other Page Speed Optimisation techniques to ensure the pages of the site load fast. Do security maintenance work and regular backups of the site… which should be done on ANY website btw. We have used Facebook and Google Search to assist with HEAPS more people around Australia (and overseas) learning about their business and the 1770 and Agnes Water Region. We showcased their website in our own Green Valley Digital email newsletter a few years ago which also helped promoted the business. We’ve run Google Adwords Campaigns for them at various times. We’ve shown their site to new clients over the years. Many have also seen it themselves on our website. Most recently we showed the site to a Canberra client of ours who didn’t even know of this really great sunny holiday (or lifestyle/residential) destination in Australia. They’ve since started telling their friends and others in Canberra about the website and destination too. We arranged for Facebook Targeted Ads to be run. One campaign saw their number of ‘likes’ increase by 6,000 within a very short space of time! Social Proof: utilise social media to prove to site visitors that their business is great: For this we provided a lot of consultancy and one of the many activities we helped the client implement was embedding customer posts in their facebook page (called ‘Visitor Posts’) into the Guestbook section of their website. You can see them here (click here). We also helped make sure that plenty of customer testimonials were added into the website. Provided many other additional digital marketing strategies. Made sure Google Analytics was setup and that they have access. Provided training so they know how to login and update their website. We trained several staff members. Provide hosting services for their new website. A very, very happy client :). 1770 Beach Accommodation work closely with us and report goals they’ve achieved, KPI’s (Key Performance Indicators) and other successes which they track. We have a close working relationship (as we do with all of our clients) and they trust us fully. We’ve seen them go from strength to strength. We can’t provide actual goal and KPI data that 1770 Beach Accommodation have shared with us nor provide exact digital marketing strategies we have done with them as that would breach confidentiality (which we take very seriously with and for all our clients), but we can say our client is very happy. Click here to view the website.